Most modern day computers have several GBs of RAM memory, nevertheless, there are still moments in which due to Windows, or any other software, we notice that the tasks we are working on with our computer aren't executing as quickly and smoothly as they should. It is for this kind of moment that WinRam has been developed, an application that is dedicated to memory optimization at specific moments. 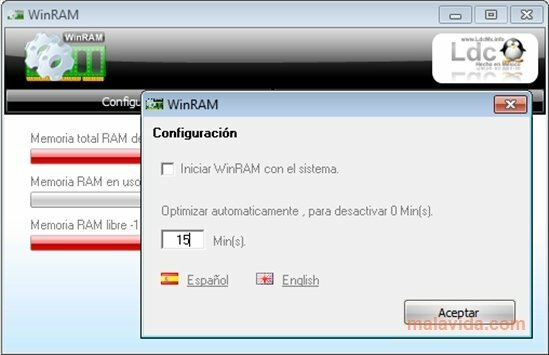 WinRam is a small application that hardly occupies any memory, and that works to free it. To do so it uses different methods by means of which it makes sure that the data that is loaded in the RAM memory is totally necessary for the PC to work properly. On many occasions, when we open an application, it loads several libraries, fonts and other material that are not cleared from the used memory when we close the application. We start to notice how this affects our computer when we start straining it with the amount of open processes, to such a point that the full system feels the effect. 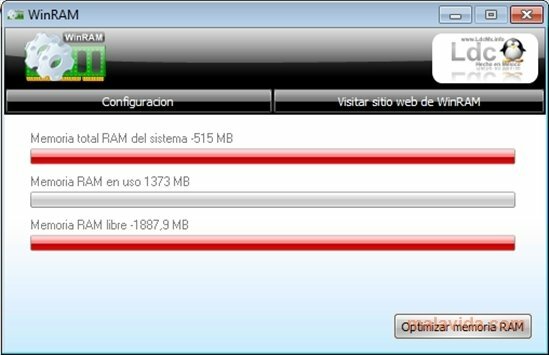 That's why WinRam is an application that will help us avoid terrible headaches due to the system malfunctioning.